As you know if you read my previous post about this book, my father snaffled it while I was in Qld, and I didn’t have the heart to ask for it back. But I found a copy at my library, and I finished reading it this week. 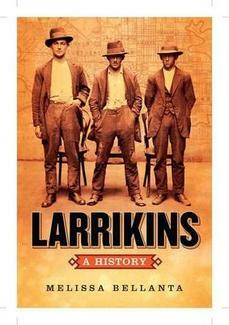 Larrikins, A History, by Melissa Bellanta is a terrific book and I understand why my father didn’t want to part with it! As you can see from the cover photo, 19th century larrikins were confident. Despite their obvious origins in the impoverished working class, they’re obviously willing to take on anything and anybody. And whereas today’s larrikins are associated somewhat favourably with Australian identity because of their irreverent attitudes, their scorn for pomposity, and their scepticism, these 19th century lads were the subject of middle-class disapproval and well-justified police attention. You can tell from the photo that they absolutely do not care. Girls who took up this type of behaviour were called ‘donahs’ but Bellanta makes the point that it’s harder to find credible evidence about them because of the way they were depicted in the media, which often associated them with prostitution and alternated between labelling them as rough, belligerent young women who gave as good as they got, or implied a lack of agency altogether. Cartoons in publications like The Bulletin were often based on burlesque traditions and bore little relationship to reality, though the way they dressed was calculated to offend. Certainly there was tribal male violence towards these girls, but there is also evidence in court records of provocation. On the other hand males were more likely to be charged with delinquency than their female counterparts. What I really liked about this book was the way in which Bellanta makes the connection between these 19th century larrikins and their counterparts today. In doing so she’s not talking about the scallywags that we take a perverse pride in, but rather the ones that most Australian disapprove of, rebellious youth who engage in racist riots, gang violence and raunch culture. She also makes the point that the media is much like the media of the past in that they too use simplistic juxtapositions to whip up community outrage. There was then the same moral panic from some, and the same blindness to bad behaviour and excuse-making from others. Sometimes, then as now, this led to unfair trials and unfair punishments. Bellanta has a nuanced view of all this: citing court documents that reveal the ordinariness of much of larrikin life, she says that this ought not to blind us to their capability for violent crime. Indeed, such was the fear of street-crime that Oliver Twist was banned in 1845 because it was feared that working-class people might emulate the thieves. Larrikinism was transmuted to its present meaning by World War I. The image of a ‘true-blue digger’ came to be the cocksure Aussie soldier, who despite his salty language and predilection for hijinks also had a heart of gold. But the demise of 19th century larrikinism was also hastened by the emergence of football as a tribal outlet where youth could let off steam at rowdy matches, and many of the ‘pushes’ had their own teams where on-field fisticuffs were the order of the day. Reforms of the penal and justice systems led to more lenient sentencing for first-time delinquency offences too, and there were also changes in inner-city lifestyles as tenements were demolished in slum clearance and factory developments. As regulation of the retail sector increased, opportunities for street-life-and-trade decreased, and there began to be a more positive association between working-class people enduring hardship with stoicism as well. The popular image of the larrikin became Ginger Mick, Stiffy and Mo, and The Sentimental Bloke. I was fascinated by this concept of the Aussie larrikin for many years after discovering its origins through the poetry of C.J. Dennis which led me to write an article about it (published by the North American Journal ‘Antipodes’ in 2007). I found the juxtaposition of the early frightful street larrikin with the modern-day notion of the ‘loveable larrikin’ quite odd. I did find many parallels, however, between the larrikins of old and the shirtless men who punched fists and waved flags at the Cronulla riots in 2005. My research certainly took the shine off that word ‘larrikin’. Sounds like Melissa Bellanta has done a great job with a subject I believe is important to our social understanding.